Photo taken from their site. Well Told Health is a Canadian company who uniquely crafts whole food, Health Boosters in small batches, and are science based in their approach. Well Told Health is certified organic by QAI, Non-GMO project verified, and products contain no synthetics, no fillers, no isolates and are gluten-free and vegan. The Antioxidant Booster ‘fights against the damaging effects of free radicals, which can occur as a result of emotional stress, physical exertion and environmental toxins.’ Well Told Health suggests taking this booster for those who work out due to the fact that intense workouts create an oxidative stress in the body, which in turn causes us to age faster. Living with emotional stress, antioxidants can help to protect against the physical damage that can result from it. Most of us probably do not get at least 10 portions of fruit and vegetables in a day, therefore we are most likely not getting enough antioxidants in our diet, which are only found in plant-based foods. Antioxidant Booster includes: organic amla, raw organic cacao, organic cloves, organic grape skin. The Vitamin Booster is a ‘plant-based sunshine in a bottle’. Vitamins are an essential factor in maintenance of bones, teeth and general health. Vitamin Booster includes: organic Portobello mushrooms, organic spinach, organic quinoa. Note: this review is in collaboration with Linder Surprise & Well Told Health. I am a very busy girl. I have an early morning job as a Barista, I am in school currently taking two courses, and I am also managing two companies – one freelance makeup artist, and a beauty school. So, you can imagine my load. On top of all that, the weather tends to affect my physical health as well. So, naturally I chose to give the antioxidant booster and vitamin d booster a try. My first impression on Well Told Health was that the packaging looked very nice. I love simple designs, so the box was enough to intrigue me about the product. Upon opening the box, we were provided with an introductory sheet about the product, their company, along with the supplements. The supplement bottles are beautifully designs and are made of plastic, therefore it’s fairly light, and easily transportable. 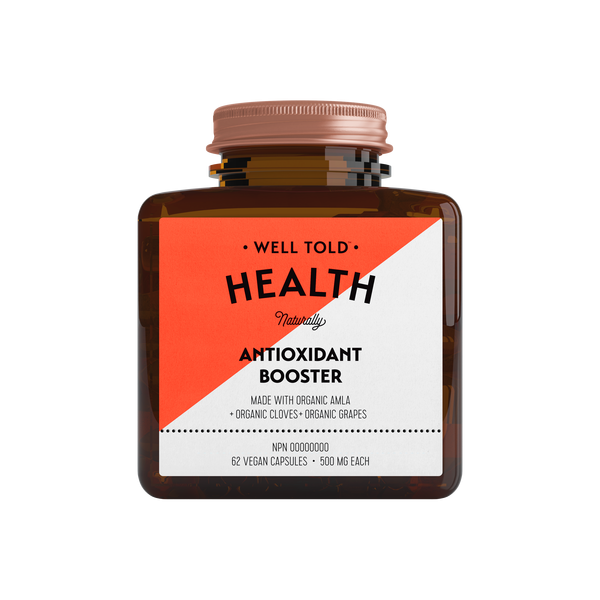 I’ve been using both Well Told Health Antioxidant Booster and Vitamin D Booster in the last two weeks, and I have noticed a dramatic difference in my overall health. It has helped me not only feel better but has helped to manage my stress both physically and mentally. My overall work performance as a result has increased. I tend to struggle with maintaining supplements, however, with the beautifully designed bottles and product claims I found it was easy to take daily. With a variety of clean supplements, it invigorates and nourishes the body with organic food, and nothing else. Exactly what makes Well Told Health amazing. While I reviewed these, my friend Linda tried the Energy Booster in hopes of helping her feel more energized so she can cut down on caffeine. For her thoughts, you can find her here. If you would like to try any of these boosters, click here. They arrive in the mail super fast! The best part? If you use LINDERSURPRISE15 at checkout, and receive 15% off your purchase! Have a wonderful week beauties! Always take a little bit of time in your day to take care of yourself. “Instead of doing nothing because I’m overwhelmed, Today I will do something even if it’s small because it will be one step closer to my goal.” – Unknown. NOTE: THIS POST WAS ORIGINALLY PUBLISHED FEB 18 2018. DUE TO SITE HOST TRANSFER DATE IS OF SITE TRANSFER PROCESS.